Although this blog has been quiet over the summer months, there has been plenty happening in the background, and the level of public activity will be rising shortly. Time then for a quick recap on where we have got to and how the plan for the review will be unfolding over the next few months. A Critique Phase, which considered the existing Code, was completed in June 2014. The report from this work is available from the Muirburn Group's page of the Moorland Forum’s website. 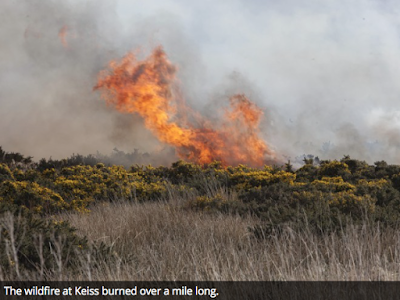 After discussion, the Scottish Government gave instructions to the Moorland Forum to produce a revised Code, which will cover burning and cutting, and work started in January 2016. 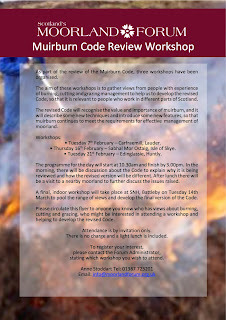 Although a range of people are expected to refer to the guidance in the revised Code, the muirburn practitioners are the main target audience, and it is important to maintain a focus on the requirements of this audience. Some guiding principles have been agreed with the project Steering Group to help maintain this focus. Principally, the revised Code will be an online document. This will make it easy to provide access to additional information from the Code through electronic links, and this format will also allow the Code to be kept up to date easily. At the start of the review process, a first, rough draft of a revised Code was produced to initiate discussion. There will be many issues to address as part of the development of the revised Code; some of these will be straightforward but others will be more contentious. Sub-groups have been established to review different sections of the Code and the feedback from these groups is being incorporated into a further draft of the revised Code. This draft will be tested in a series of four workshops to be held in different parts of the country over the coming muirburn season. Feedback from these workshops will be used to produce a final version of the Code at the end of March 2017. The revised Code will not come into effect until after the end of the muirburn season on 30th April 2017. It will then be available for the start of the next Muirburn season on 1st October 2017. The current programme of work will produce a revised version of the Muirburn Code only, but it will signpost other information. The review is seen as the start of a process that will hopefully address some or all of the additional issues identified during the Critique Phase, such as research and training. An adaptive approach will be adopted to refine the Code and the supporting information so that the guidance can evolve as knowledge and experience develop, or as there are changes to regulations. A series of four workshops is planned to cover the north west, the north east, the south east and there will be a final workshop at Battleby to pull together all the feedback and produce a final version of the Code. The next draft of the revised Code will be made widely available for comment, and I will welcome all feedback. The Steering Group took part in a conference call on Friday, 13th May. We considered a very first draft of a revised Code and we agreed to establish a series of sub-groups to develop this draft further. These sub-groups will draw on the expertise of steering group members, but we will also draw in knowledge and experience from beyond the Group membership. Please let me know if there is anyone who would like to contribute to the review process. One of the challenges the Group faces, is to keep the focus on producing a practitioners guide. There is no end to the amount of information that could be placed into a revised Code, but unless we restrict this we will lose the message in verbiage. We have plenty of issues to address and some of these will be a bit contentious, but the aim remains to produce a draft guide at the end of August. We will then be testing this draft during four workshops between October and March. The Group will be agreeing locations for these workshops soon, but we will be pleased to hear from anyone with suggestions about where these meetings could be held.